In the last TechTip, we covered Tire Maintenance and weight carrying capacity. We learned that tires can provide many years of useful life when properly maintained and when inflated to the tire pressure required to carry the load of the basic RV and the ‘stuff’ taken along. Tire longevity requires the tires to be properly inflated at all times. This brings us to the topic of Tire Pressure Monitoring. A caution before beginning our discussion: When automating tire pressure monitoring, you remove one of the most important ways to ensure trouble free tire maintenance: Examining each tire regularly. Tire Pressure Monitoring Systems (TPMS) lull many RVers into thinking that if the tire pressure is OK, then all is good. This could not be farther from the truth. Tires will maintain air until they don’t, treads can separate from the casing and yet the ‘tire’ will still hold air. Cracks will appear in the sidewalls and tread that go unnoticed unless a physical examination is routinely undertaken. Make the commitment to physically check the tires frequently for all of the other issues and leave the TPMS to do its job of displaying pressure and warning if low. 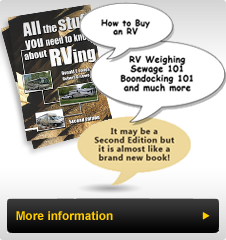 Since RV Tires are the "big balloons of air on which we ride” it is imperative that we know if they are inflated as required and alerting us, if they begin loosing air, ideally as soon as this change occurs. As the pressure drops, tires will begin to heat up and start to deteriorate, ultimately leading to failure, sometimes with catastrophic results. In a perfect world, each tire would be examined for its condition and the tire pressure checked when the tire is cold, first thing in the morning, before being driven on. When the vehicle is stopped a further walk-around examination procedure would be carried out, checking to ensure there are no tires with low air pressure or damage. This procedure would be repeated each day. Many of us have seen truckers kicking or batting the tires on their trucks and trailers when stopped at a rest area, listening for any difference in the sound from one tire to another. That is his/her way of checking the tire pressure, while on the road, knowing that they all started out at the proper air pressure. Modern technology has provided a better, safer and more accurate way to monitor tire pressure (and in on some versions tire temperature) in real time using a TPMS. Most new cars and trucks are equipped with built in monitoring systems, however these systems do not have the ability to add towed trailer tire monitoring to them. They also are incapable of being monitored from a RV if they are being towed. Thus, there is a need to add an independent method of monitoring the towed trailer or the vehicle while being towed as well as the RV/Towing vehicle actually do the towing. Ideally this monitoring will be "real time” alerting the driver immediately when a tire’s pressure drops below a safety threshold. All Tire Pressure Monitoring Systems (TPMS) measure the air pressure through a sensor mounted inside on the wheel (as many OEM vehicle manufacturer’s units are) usually near or as part of the tire valve, or by means of a sensor mounted on the valve stem. Both systems require an internal power source to operate, some are sealed and some allow users to change their batteries when they are low. Typically, these batteries will last five to seven (5-7) years. Many systems rely on tire movement to activate, thereby hibernating to extend battery life when not in use. Many send a signal reading every five or ten minutes that is picked up by a nearby antenna or the dash monitor panel to conserve power. Most systems designed for RV use, also have provisions to monitor a towed vehicle or trailer with the purchase and use of additional sensors that are be mounted on their tire valve stems, then activated on the RV TPMS monitor panel following a defined procedure. All sensors are position-specific, meaning that if a warning occurs, the tire position is identified and if moved to another tire position it must be re-calibrated. The display panel or monitor may be part of the RV’s in-dash entertainment system or a standalone monitor. The standalone systems often are equipped with a power outlet plug or they may be hard wired to a power source. Some systems also display the tire temperature in addition to the tire pressure. This feature may alert you to an impending situation sooner than just monitoring the air pressure since the alert or warning function does not display until a warning threshold is crossed (often 10% loss in tire pressure). Temperature monitoring may also highlight a problem with other near the tire components such as a brake shoe or caliper that is creating drag, thereby causing the tire temperature to increase. While not that common, this is a feature some find valuable. Avoiding distraction by operating without user intervention should be a major part of the TPMS selection. The display will show a graphic simulating a RV with all tire positions shown, some allow the user to display or hide the number and position of the tires. Many allow highlighting a particular tire to display its particular tire pressure and temperature, if monitored. A graphic that allows with a quick glance to determine that all tires are OK is preferred, since you don’t want to focus on the display while driving. If the RV is driven at night, then having the ability to easily dim the display, to reduce the glare is an important feature. When the tire pressure drops below the alarm or warning threshold, it may be preferable to have an audible as well as a visual display. One of the difficulties with an audible warning is that wide ambient temperature swings can set off the alarm, often in the middle of the night awakening those sleeping in the RV. This is more prevalent when the system is activated simply by being plugged into a power outlet and is ‘On’ all the time. Having the ability to customize the warning levels for temperature and tire pressure allows customizing the TPMS to both the needs of the user and also the specific RV. Some portable systems allow the display to be moved to the Towed Vehicle when driving it, however with the adoption of TPMS as part of the standard equipment on newer vehicles, this ability is less needed. The reality is, if one is just heading off for a quick trip to the store, it is unlikely that the display will be moved by the RVer. So how does an RVer protect the safety of all travelling with them? First, make it a habit to monitor the system before departing. Turn on the display, allow it to update which may take a few minutes, or require movement to reactivate the sensors and ensure that every tire position is displayed, including the towed vehicle and that the tire pressures are where they should be when ‘cold’. While underway, I prefer to monitor this display during the initial part of the trip to ensure that all tire pressures (and temperatures if provided) are rising and stabilizing as expected. At that point, I rely on the system to alert me if something is amiss, either from a sensor that is weak and not always reporting or a tire pressure (or temperature) issue. There have been times where I’ve continuously monitored a specific tire (perhaps after having issues with it) and having direct access to its information if helpful. How much does a TPMS cost? Generally, these systems can be installed by a do-it-yourself RVer. Occasionally, a repeater kit or remote antenna may be required to reliably monitor a towed vehicle, which will increase the cost and complexity of the installation and that may make a RV owner choose to have the system installed. It is important to monitor a towed vehicle since the rear view camera will not show a tire that has gone low or been destroyed. These two photos of a vehicle that pulled in beside us in on our 2015 trip to Alaska, make the point. This RVer had not been aware that the tire had disintegrated causing some damage to the towed car and that it was riding on the rim until forced over by a trucker. I talked with him and he told me he had driven it over 100 miles (160 km) the evening before and at times he was driving at 70 mph (120 kmh) which in Alaska is way too fast. He was shocked when he walked around to see the damage! I recommend budgeting the cost of a typical RV tire as a number to use for a complete installation. Certainly, should a tire blow, the cost of the road service, the cost to buy a tire and have it installed on the roadside, the physical damage to the RV (or tow car) will pale in comparison. If lives are threatened or worse, how does one value that? Safety should be our paramount concern! For a review of the current (2015) availability of Tire Pressure Monitoring Systems, check the September, 2015 Family Motor Coaching article by Mark Quasius, on pages 46 to 53. A PDF version is available under this TechTip on our website, if you would like to read it and do not have access to it through FMCA as a member. Here is the link. For those that tow a dolly or trailer occasionally or those that often have a trailer that sits frequently and for older cars and trucks without a monitor system, then check out under the Accessories tab for a simple non-dynamic solution. It is one step above getting out the tire gauge and actually checking each tire. Simply walking around the vehicle and looking at a well-made Tire Pressure Indicator mounted on the valve stem is all that is required. I hope you found this TechTip helpful and will add a TPMS to your RV before your next trip.